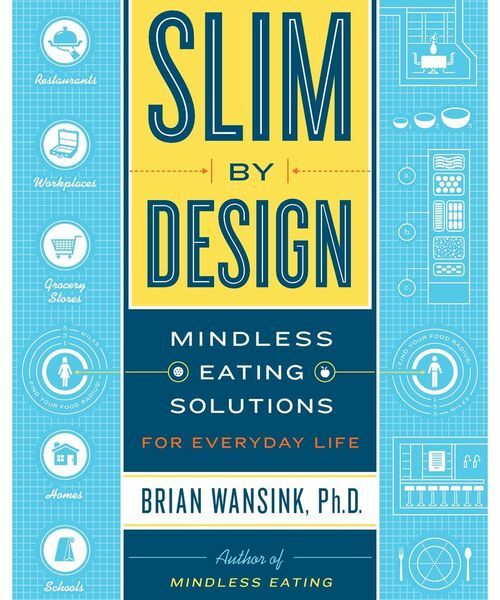 In his book, Slim by Design, eating-behavior expert Brian Wansink shows us how to get our kitchens working better. Your kitchen might be the workhorse room in your home, but it also might be working against you and your waistline. That’s the scenario Brian Wansink — a professor at Cornell University and the director of Cornell’s Food and Brand Lab, where he’s the leading expert in eating behavior — presents in his book, Slim by Design: Mindless Eating Solutions for Everyday Life. The book is divided into chapters on how the design of restaurants, supermarkets, lunchrooms and our home kitchens affects our mindless eating habits, those triggers that cause us to eat more, snack more and eventually gain weight. Have an all-white kitchen? Do you keep cereal in view? Got a TV and big comfy chairs in your kitchen? Then you’ve got several booby traps that might cause you to eat more without even realizing it. 1. Take all food off the counter unless it’s fruit. In what’s referred to as the Syracuse study, Wansink and his research team visited 240 homes and measured and photographed everything. They documented plate size, whether there were TVs in the kitchen, spice racks, radios, you name it. 2. Get rid of the clutter. It’s not just food working against you, either. All those piles of mail and newspapers and kitchen gadgets aren’t doing you any good. Wansink has found that in cluttered environments, people eat 44 percent more snacks than those in a clutter-free environments. 3. Paint your kitchen anything but white. OK, this is a tough one. According to a Houzz survey, almost 75 percent of homeowners prefer a soft and neutral kitchen. But Wansink has found that white and bright spaces tend to stimulate eating. 4. Make your kitchen less lounge friendly. This is another suggestion that goes against what many homeowners seem to want in their kitchens. 5. Make it easier to cook. Wansink admits that the science isn’t as strong here, but it’s based on a few trends he and his team have observed about what people say they do. 6. Rearrange your food. You’re three times more likely to eat the first food you see in the cupboard than the fifth one, Wansink has found. That means if the first thing you see is a bag of chips, look out. Instead, make sure the healthy foods are the first ones you see and toss the chips and cookies in the back.